Packing up a lifetime’s worth of belongings in preparation for a move is among the most stressful tasks to check off the To-Do list during this major transition. No matter how far you may be migrating, the fact remains that we all have a tendency to accumulate massive quantities of stuff over time—and as such, it’s important to formulate a strategic approach when planning to transport these items. From being proactive in your approach, to collecting the proper supplies needed, right on down to room-by-room packing guidelines, we have compiled some essential tips to make this painstaking process as smooth as possible. As soon as your moving date is confirmed, begin making arrangements for the big day. The less you have to pack, the better, which is why it’s integral to take inventory of your belongings prior to boxing them. A good rule of thumb is to sort into one of three categories: to be donated, to be sold, to be discarded—leaving only what remains as the prime area of focus. Items such as books, movies and music can be set aside immediately, as you will likely be able to get by without them for the short-term. Once you have assessed how much you will actually be transporting, it is far easier to determine how many boxes will be needed, as well as how much packing tape, bubble wrap, labels, and more will be sufficient. Each box should be filled to capacity, to limit movement during transport, with heavier items stacked on the bottom, and lighter decor on top. Anything that is particularly fragile—or valuable—should be packed separately. Each room has its own nuances, but there are certain helpful hints that can serve just about any situation when taking inventory of furnishings, decor and personal effects. Most kitchens are home to some of the more fragile items, which is why it’s advisable to use partitioned boxes to separate glasses and plates, taking advantage of any original packaging you may have saved, if available. Towels can be used as an added cushion between breakables; silverware, as well, should be wrapped to avoid tarnishing. Bed and bath items, such as linens, provide the perfect insulation for more delicate toiletries, such as makeup palettes and perfumes. When moving larger pieces of furniture, it’s best to disassemble as much as possible for easier transport. Wall hangings should be wrapped with furniture pads and stacked vertically to avoid breakage. In many cases, dressers can be moved with the contents inside, and hanging clothes can be conveniently consolidated using plastic bags as a covering, creating a DIY mobile wardrobe closet. Wrap smaller fragile items in colored tissue paper, and label accordingly, to avoid them being accidentally discarded. While it may seem silly to physically zone out areas of your home in preparation for packing, there is a method to such perceived madness. Heavier items should be confined to smaller boxes, as these will be easier to maneuver; be sure that none exceed 50 pounds. Use plenty of protective material—whether paper, Styrofoam “popcorn,” bubble wrap, or excess blankets—to overcompensate in preventing breakage. Once finished, label each box with the name of the room its contents will reside in at your new home, as well as a number designating its level of priority to unpack. Of course, if all else fails, there is no substitute for hiring a professional moving company to assist in the packing process. Most movers will follow these same tips in helping to ensure the transition to your new home is seamless and stress-free. 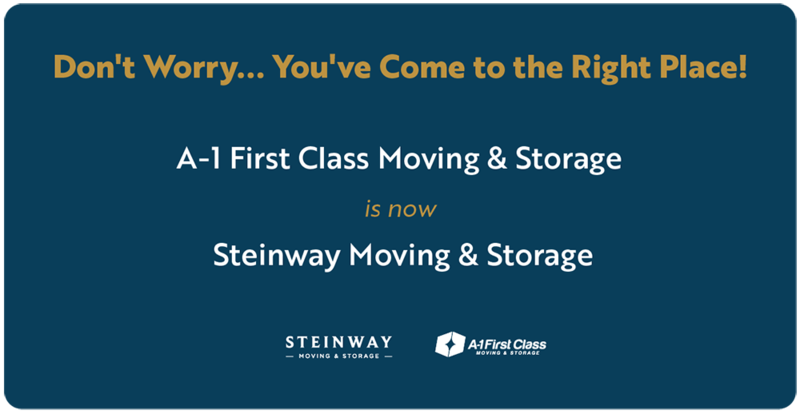 To request a quote, contact Steinway Moving & Storage, today.